Holiday decorating can seem overwhelming, but you don't need to stock up on Christmas figurines and giant elves or spend hours and hours of precious time in order to make your house feel festive. Get holiday-ready by picking a few of the tips below! 1. Make an entrance. Upgrade your entry by placing a tabletop-sized tree in a galvanized bucket and placing it outside your front door. 2. Go big in a blank space. Do you have a big bay window or large, windowless area on an exterior wall? Skip the door and hang a three-foot wreath on an unexpected space. 3. Change your pattern. Thanks to memories of my L. L. Bean-robed brothers on Christmas morning, nothing says "holiday" to me quite like plaid. 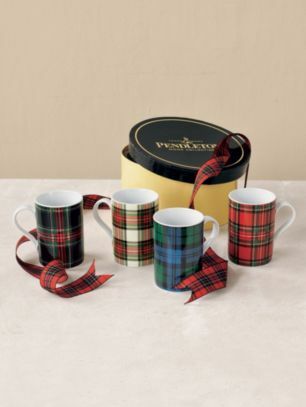 Just a touch of the bold pattern around the house -- like these tartan mugs -- goes a long way. 4. Crank the tunes. Stimulate your senses (multisensory decorating!) by turning on some holiday music. My current favorites include A Very She & Him Christmas (featuring the velvety-voiced Zooey Deschanel), the haunting sound of Anuna's Christmas Songs, and the classic A Charlie Brown Christmas. 5. Cozy your couch. 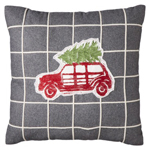 Zshush up your couch with a decorative throw pillow (just one is fine) and a cozy blanket. This pillow and faux-fur blanket from Target have created my kids' favorite nesting spot. 6. Let there be light. If you have a fireplace, use it! If not, get some candles (real or LED) glowing. 7. Green your chandelier. Have a chandelier? 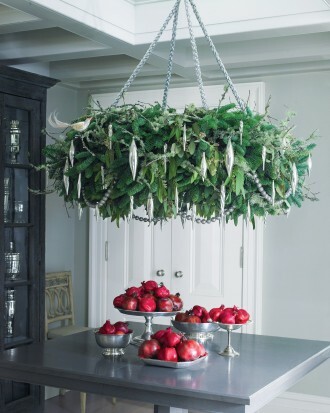 Weave or lay greens among the arms for an instantly festive light fixture. 8. Make good smells. Take a cue from Clueless (again, multisensory decorating!) and fill your house with delicious smells. Skip the burning cookie dough and simmer mulling spices on the stovetop instead. 9. Deck the walls. Temporarily grace your walls with Christmas-y art -- like these great giant printables from Caravan Shoppe or a cardboard deer trophy from Uncommon Goods. 10. Present your archives. Go through your photo archives and find family snapshots of holidays-past. Place them in inexpensive frames and put them on display. 11. Make garland. This can be a fun project with kids. 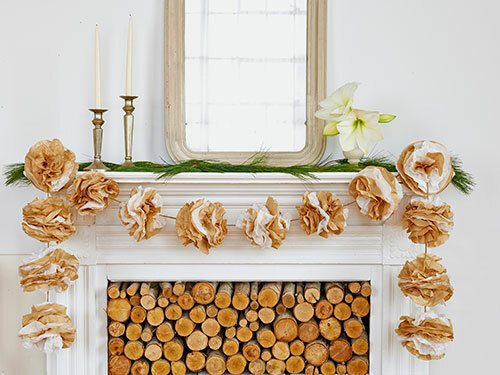 Make garland (like this one made from coffee filters!) and string across a mirror, window, or headboard. 12. Multitask gifts as decoration. Get ahead of the game by wrapping gifts and using them for decoration. Fill a pair of wellies with ribboned boxes and set them in your mudroom or foyer area. 13. Trim the table. While I'm not a proponent of investing a bunch of money in holiday-specific tableware, I think short change spent on of-the-season accent plates can go a long way to making your regular meals feel more festive. 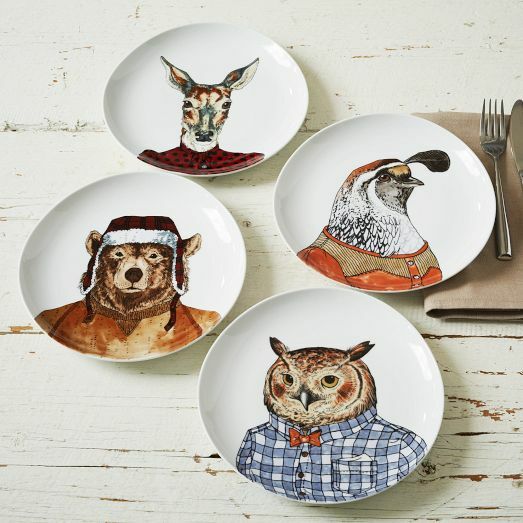 These Dapper Animal Plates are gracing my table this winter. 14. Gather. Gather a collection to create impact. Sparkly ornaments in a bowl, nutcrackers on a bookcase, or candy canes in a glass canister are great options. 15. Light the way. Expecting guests? 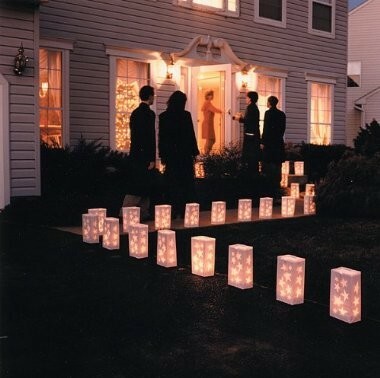 Light the way with paper bag luminaries. Do you have other favorite holiday decorating hacks? Feel free to share in the comments below!